A team photo showing all the top prizes they have won the past year. On the right, winning the EDF and the left, winning the BDF. 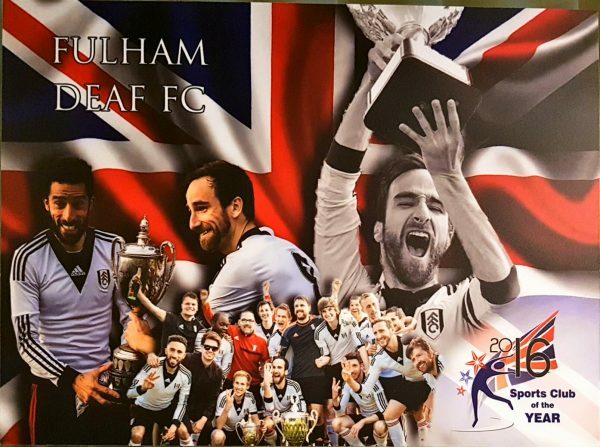 Fulham attended the biennial Deaf Sport Personality Award of the Year (DSPY). This is an event to recognise achievements in deaf sports over the past two years. We were nominated for the Sports Club of the Year Award, and with huge thanks to the people who voted for us on the night, we came home winning the prize! This marks off an amazing year we’ve had. Winning the BDF, EDF and being promoted in our hearing league!